Maiduguri — The World Health Organisation (WHO) has lamented that Nigeria accounts for the highest case of measles on the globe. The Borno State Coordinator of WHO, Dr. Audu Idowu, was quoted in a statement on Wednesday to have said: "Despite the availability of safe and effective vaccines, Nigeria accounts for the highest burden of measles globally, with 3.3 million unimmunised children." 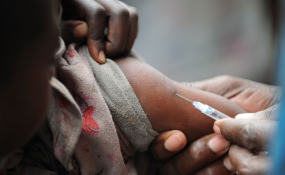 The statement signed by Eva Hinds, a Communication Specialist with United Nations Children's Fund (UNICEF), said in order to tackle the growing cases of measles, the Nigerian Government is working in collaboration with UNICEF and WHO. The statement read in part: "Following a growing number of reported cases of measles, the Government of Nigeria, in collaboration with the United Nations Children's Fund (UNICEF) and World Health Organisation (WHO), will conduct a vaccination campaign in Borno to protect 1.7 million children aged 6 months to 10 years against measles." The statement disclosed that the campaign will run from 21 - 25 March 2019. The statement quoting Babagana Adiso, Director of Disease Control in the Borno State Primary Health Care Agency, said: "Immunisation remains one of the most effective ways to protect children from killer diseases. This campaign gives us the opportunity to protect the lives of children at risk of missing out on routine immunisation in Borno." "UNICEF will continue to support the Government of Nigeria to reach every child with the measles vaccine. I therefore urge everyone to ensure that all eligible children access the vaccine during the campaign period," UNICEF Borno Chief of Field Office Geoffrey Ijumba was quoted to have said. It also revealed that the campaign will be implemented in two phases. The first phase will take place in Maiduguri Metropolitan Local Government Authority (LGA) in Borno from 21 - 25 March and includes the most affected and at-risk areas as well as accessible settlements. The second phase, to take place later in the year, will cover the remaining 12 local government areas.